Elizabeth Devlin is a self-produced NYC singer-songwriter, releasing her third full length album, Orchid Mantis, on the 8th. 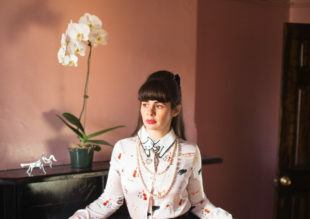 Orchid Mantis is the follow-up to her previously released albums: For Whom the Angels Named, (Fall of 2011), Ladybug EP, (Winter 2011) and All Are Relative (Winter 2009). Devlin has toured nationally, internationally, and performs regularly around Brooklyn and NYC. Although Orchid Mantis opens with “Middle Car”, you may find “Take My Life” [2:55] to be more accessible as a first listen, melding the vocals of both Devlin and Michael Wookey. The incredible vocal interplay between these two very quickly stuck with me and begged for multiple listens. Instrumentally, the melody constructed by Devlin brought me to an ‘old English’ era. three things that I hear, will it be enough? Tether me to moments when the now escapes my grasp. Count all the externals while internals detach. Lead me from the dance floor, lead me to my bed. Take me from the party, that is what she said. Wrap me in good intentions, hold me in this dark hour. Tie my balloon heart to your wrist, save me from this breeze. “For Valerie” [3:19] is a slowly built, careful harmony between Devlin’s autoharp and Emily Hope Prince’s cello. Taking a handful of repeated listens to full capture my own thoughts on the song, I found “For Valerie” to be rather poetic, and living in its own genre. Imagine the instrumental soundscape to be absent — the track instantly transforms into a folk ballad. Yet the addition of the climbing backdrop makes it so much more visceral. Devlin here seems to ascend to the vocal sentiments of James Vincent McMorrow, finding a very unique voice and sound in her efforts. “How Do You Call Your Lover Boy” [2:10] shows off a different side of Devlin’s vocal talents. Whether it be more grit, or simply a different approach, the impression is one of both passion and confidence. The sub-sections of tracks detailed here represent some of the most memorable creations on Orchid Mantis. Speaking to a new life and perhaps new direction, the album was Devlin’s first since 2011. Abundantly clear is the thoughtful writing and production throughout — there was no filler, and not a single line that failed to carry its share in weight and significance. By themselves, “Middle Car”, “A Wedding Song”, “Bonnard & Martha”, and “Delilah” would have made for a rightfully good EP, sitting at a 3 to 3.5 out of 5 in my book. The creatively transcendental nature of the remaining tracks, though, elevate Orchid Mantis to a new dimension of being. “Take My Life”, “Cold Sweat”, “For Valerie”, and “How Do You Call Your Lover Boy” set a different standard for Devlin, and her intrinsically melodic, beneath-the-surface folk sensibilities — they pull the weight in earning Elizabeth Devlin a 4.5/5 on her latest album. You can find Elizabeth Devlin on Bandcamp, where you can buy Orchid Mantis. To keep up with her news and announcements, Facebook is a good choice, with more personal musings found on Tumblr.